why test the focus variado expert, other than for the fact that it has an intriguingly inexplicable name? 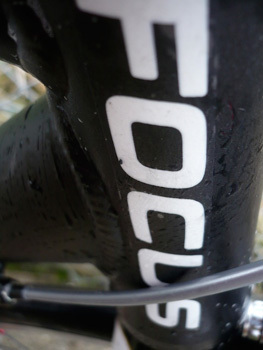 focus are a german brand, this year supplying frames to the milram professionals and to nicole cooke's team; but they'll be riding something that hits the upper reaches of the focus range, while the variado is pretty near the bottom. as far as my numerical skills could figure, this bicycle is at the very cheapest end of the road range exclusively sold by uk online mega-shop, wiggle. as is perhaps to be expected nowadays, the tubing leans towards the oversize end of the spectrum, particularly the downtube which is tidily ovalled where it joins the the seat tube at the bottom bracket. the anodised finish is matt rather than the more usual gloss, and the black and gold graphics are very contemporary and refreshingly simple. the chainstays are stylishly curved, and the simlarly curving seatstays look positively anorexic in comparison to the rest of the bike's tubes. this frame would appear to be aimed truly at the race market, since the are no mudguard or rack eyes to be seen. the stem, seatpost and saddle are all provided by concept, a brand on which i can find out nothing whatsoever, though they do provide the functions for which they were born. the saddle looks remarkably similar to some of those emanating from the fizik range, but there is no shame in that. bars and chainset are provided by italian based, but far eastern constructed fsa, both fashioned from aluminium. there is very little in the way of carbon on this bike. the chainset is of the compact variety, in this case a 50 outer ring and a 34 inner; while i'll deal with this more when we get to the riding bits, the gap between rings seems a bit on the excessive side. the regular 53/39 chainset gives a 14 tooth gap, while the 50/34 bumps that up by two teeth. why? the chain played on a 12-25 cassette on the back wheel. the bars have an oversized mid-section and bear bendy bits seemingly favoured by fsa these days (i have similar carbon drops on the colnago) apparently described as a parabolic curve. gears and brakes are taken from shimano's 105 range and either anodised or painted black (sorry, i know not which). 105 has yet to inherit the advances made in the new dura-ace 7900, so the gear cables still exit the side of the levers, with only the brake cables hiding under the white bar tape. shimano also provide the wheelset:the pair of rs10s are all black, including a 16 spoke radial straight bladed front and a rear that involves 20 two-cross of the same type. tyres are the rather excellent schwalbe lugano, formerly known as the breezer. wiggle advertise that all their focus bikes arrive ready to ride, which is almost true, but seemingly, in order for that to happen, the box in which the variado expert arrived was quite huge: i keep expecting to receive a council tax bill for keeping it in thewashingmachinepost bikeshed. a box of this size is necessitated by the seatpost and saddle being already in situ, fully extended. 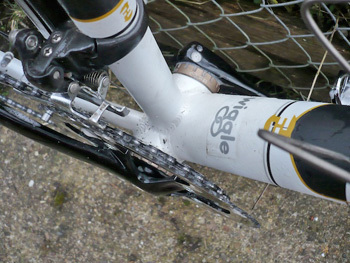 the handlebars, however, were not fitted in place: the faceplate had to be removed from the stem and bars then put in place at the desired angle. every other bike that has arrived at washingmachinepost towers has had the seatpost and saddle placed within the box, the stem at right angles to the frame, and the bars hooked under the top tube. this makes for a much smaller box, and it is surely easier to fit a seatpost than to clamp a pair of bars in a four-point stem? it's worth mentioning, before we head off into the wide grey yonder, that this is quite substantially the cheapest bicycle tested on thewashingmachinepost. this was my choice and not that of wiggle, who kindly supplied the variado expert for test and review, principally because i'm interested to see just what's available at the non-exotic end of the market. i loved this bicycle. that's not to say that it doesn't have its faults, but it was an absolute delight to ride, and during its time on islay it got around the estates quite a bit. to address those faults, lets have a look at the (albeit minor) disappointments. while the frame is constructed from lightweight aluminium, the overall weight of the bicycle is around the 9.5kg mark; not the end of the world at this price range but just a bit heavier than the never ending downward trend. having said that, it doesn't actually ride as heavy as it is: the weight is verging on the noticeable when the road heads upwards, but in fact i think i found it more noticeable because i usually ride a lighter bike. if this were your pride and joy, disappointment would be quite some distance away. it's a nippy little beast, partly no doubt due to the compactness of the sloping frame, but quite possibly because of the accuracy of the not insubstantial carbon forks. while we're turning those forks around some corners, i fear focus may have erred on the short side when trimming the steerer: the frame fitted pretty well in all departments, both height and length, but i tended to suffer from a numb left hand now and again, probably due to too much of my weight being on the for'ard beam. standing the focus next to my regular bike, the bars were a good couple of centimetres lower. at this level, it would be a nice idea to leave a bit more length on the steerer and use a few more spacers. 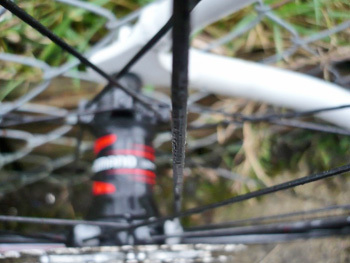 if the bars were needed this low, then placing a spacer or two above the stem wouldn't do any harm. since the variado is supplied as a complete bicycle, this is the way it was tested, and as is often the case for a long armed chap like myself, the stem was about a centimetre too short. due to wiggle being a mail order outlet, you'll have to order a longer/shorter stem if you find a change necessary: wiggle cannot offer a change at point of sale. 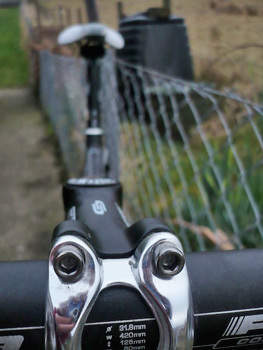 and while i have gone on record far too often as a shimano agnostic, the lever hoods grabbed at top and centre tended to make up for the lack of length in the stem. despite the foregoing, and the opportunity over the years to get used to sti levers, i simply can't. this is not to say that they do not carry out their function with near perfect accuracy, but italian suits me a lot better. it's a number of years now since compact chainsets have been available, and affixing them to lower priced bicycles seems to have become the norm of late, presumably to ease the pain and suffering experienced by those entering the sport. 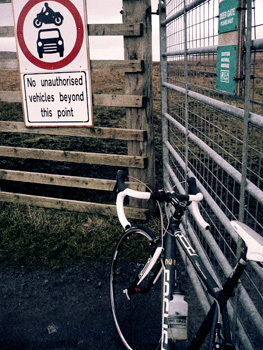 however, throughout the period of riding the focus the biggest footer i experienced was the incongruity of this setup. islay is relatively flat, so perhaps i speak out of turn, but on reaching the smaller sprocket end of the cassette necessitated far too many shifts between inner and outer rings. personally i'd rather have had a 50/36 combination (something that could easily be achieved by purchasing an appropriate ring from fsa). that's not to say that the 34 didn't come in handy on those days when i was riding like a bag of spanners. i have a deep suspicion of the latest boutique wheels, those with precious few straight spokes but i fear that may be due to my affectation for handbuilts. 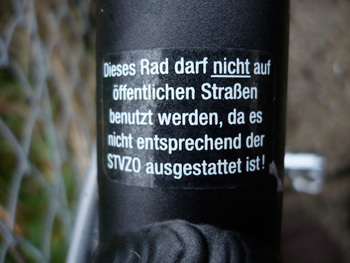 however, while the tubing employed in the frame could comfortably be relied upon to handle any amount of torque applied by the rider, the same could not be said of the shimano rear wheel with its, in my opinion, barely adequate 20 spokes. in mitigation, regular day to day riding could be coped with quite admirably, but on even short climbs, kicking hard instigated quite apparent flex and brake rub. since i do not consider myself to be a rider with an impressionable power output, this could be something even more noticeable by a stronger or heavier rider. since few, if any, road bikes arrive with a pair of pedals in place, i filled the crank ends with a pair of mavic race ti pedals; definitely a few levels of equipment above that likely to be fitted to the variado, but thoroughly reliable, smooth and functional throughout the many kilomtres already covered. nice to see a new entrant on the pedal market display a continuation of standards both in the componentry and from the manufacturer. many of the finest bikes display a spring in their step when accelerating or climbing hard, and while i cannot honestly say that the focus displayed this attribute, there was always the notion that it aspired so to do. unlike some at the lower end of the food chain, focus have cleverly imbued this machine with many of the lessons learned at the other end of the scale. it's a truly exciting bicycle to ride, something that not only didn't tire as time went on, but positively improved as the kilometres were acquired by the schwalbe lugano tyres. my regular pedalling is done on the lugano's bigger brother, the ultremo, but these tyres are justifiably part of the same stable. so they're not folding tyres and don't exhibit the flexibility and pliability of the more expensive folders, but they are ridiculously competent, having experienced ice, snow, rain and more than their fair share of potholes while on holiday on islay. shimano's brakes essentially work the same way as anyone else's, but it's the only brand that have caught me out by locking up the rear when i'd really rather they didn't. campagnolo switched the rear calipers to single pivot because testing indicated dual-pivot power was unrequired at the back wheel. shimano have remained faithful to the dual pivot front and back, so i'm putting by skiddy moments down to this rather than pilot error. probably only a campyphile would suffer from this malady. as time goes by, i become more convinced that my bum has no saddle preferences whatsoever - well, apart from that awful san marco ridden in the falling rain last year. as mentioned above, the concept saddle atop the aluminium alloy seatpost bears an uncanny resemblance to the arione family from fizik. since the latter has been highly recommended by all and sundry, mimicking its profile cannot be seen as a bad thing; my posterior heartily agreed. the matt finish isn't the easiest to keep clean, particularly in white, but it does look very good and lends an unassuming air of expense to a relatively low cost bicycle. disappointingly, despite my having had the bicycle for just over three weeks, the stem cap bolt and the stem faceplate bolts have already started rusting. how many more pennies would it have cost to fit stainless steel versions? this is not something confined to the focus, and at this price, perhaps not even surprising, but a little bit of forethought wouldn't go amiss. it's a fabulous bicycle, worth every penny in my opinion, even allowing for the minor glitches of which i have informed you above. not being, nor ever having been, a racing cyclist, i am wary of recommending what would make a good race bike or otherwise, but i can't see any reason why the variado expert wouldn't make a perfectly acceptable entry-level race bike.